On May 24 Summify/Twitter sent out this nice private yet official announcement that Summify will disappear effect June 22nd and of course no official blog post or mention on the Summify or Twitter blogs/sites. I guess we should expect Twitter to screw up every wonderful service they acquire much like they did with TweetDeck and now Summify. If you have a Twitter account connected to Summify and you are subscribed to the email summary, you don’t need to do anything. Everyone with a Twitter account who is subscribed to the Summify digest will begin to receive the new Twitter email digest byJune 22nd, 2012. In the fight for market share, the top pizza brands have launched a social media blitz attempting to capture audience and deepen customer engagement. But, who will be king? Track Social has analyzed pizza brands across hundreds of social media metrics. We found two brands significantly dominate the competition and are locked in a heated battle for the top spot. This can only mean one thing: Social Media Pizza War! The competition has come down to the two pizza powerhouses: Domino’s Pizza and Pizza Hut. They will go head-to-head in four rounds based on the Track Social’s Pillars of Social Media – Audience, Presence, Engagement and Buzz. May the best brand win! Audience measures the total number of relationships a brand has formed with consumers through LIKES and FOLLOWS. With an overall greater number of total relationships across Facebook, Twitter, LinkedIn and YouTube, this first round goes to Pizza Hut. While these are impressive numbers, even for a national brand, Pizza Hut’s number one spot might not hold for long given Domino’s ability to generate more new Likes per day. In fact, some recent promotions have helped boost numbers for Domino’s. A recent giveaway of 80,000 new Artisan Pizzas for Facebook Fans (first in mid April and again in early May) resulted in two significant bumps for Domino’s Facebook audience including a gain of over 200,000 new fans between April 11th and April 14th. Presence measures a brand’s visibility online, how well established, complete, and active it is on social media platforms. Play Today is a pizza topping themed twist on the 80′s classic matching game Puzzle Bobble. Each time a player wins level 4, Pizza Hut donates to St. Jude’s Children’s Research Hospitals. Finally a time waster that’s actually good for the world. Ideas Welcome is an innovative app designed to solicit ideas for product and service improvements from Domino’s own Facebook Fans. Using a crowd sourcing model, Domino’s allows users to vote on their favorite submissions, elevating those ideas the online community felt had merit and giving consumers the opportunity to interact with Domino’s in a positive – and possibly profitable – way. One of the top vote getters (and one of our favorites) suggested giving players of the popular video game “Grand Theft Auto” the ability to drive (in the game) to a virtual Domino’s Pizza and place an order (in the game) for a real pizza delivery so players wouldn’t have to leave their game to order food. We’ll look for that innovation in the next version of the game! And one app we expect to see in the future? A Facebook Online Ordering App Domino’s is already testing in Australia. Soon enough, we’ll be able to order dinner without missing a single status update! Engagement is about how successful a brand’s social media interactions are with consumers. When a brand posts or Tweets, do fans respond with comments, likes, and Retweets? With more users responding to each Facebook Post than Domino’s, Pizza Hut is getting more bang for it’s engagement buck. They consistently deliver clever, fun and creative posts that encourage users to hit the Like button or share them with their friends. As a rule, when it comes to inline posts, short and simple is better – but we did like this rather complicated flow chart highlighting the dilemma of who gets the last slice. We’re also fans of Pizza Hut’s series of “cartoon characters” (launched on April 23rd) called the Cheesy Bites Gang. In this creative effort to publicize their new Cheesy Bites Pizza, personified cheesy bites star in a series of humorous – and even cheeky – posts that have been generating some impressive numbers of likes, shares, and comments. Though it’s interesting to note that video posts of “real life” cheesy bites (an actor in a cheesy bites mascot costume performing goofy stunts) have faired less well. Engagement can also be about more than clever posts, cool apps or fun promos. It can also exhibit how well a brand uses technology to reach out to consumers to respond to a PR debacle. Which is why we have to give credit to Domino’s for creatively employing social media to respond to a damaging (and false) rumor that they were a financial supporter of the “Rush Limbaugh Show” during the notorious Sandra Fluke controversy. Using individual Tweets, emails and phone calls, Domino’s employees reached out to over 3,500 people who had complained to the company about Domino’s alleged sponsorship. Sometimes staying engaged means interacting with consumers at the micro level. Buzz is a measure of how much people are talking with, at, and about a brand in the Social Media Universe. When it comes to Buzz, Domino’s takes the lead, exceeding Pizza Hut in both Facebook User Comments Per Day and Twitter Mentions Per Day. In many ways, a brand’s Buzz score reflects the cumulative result of a brand’s success (or failure) in the other three categories. How much other people are talking about your brand is a measure of your online relevance and a verdict on how well your overall strategy is working. Although it was a close call, Domino’s got the higher Overall Performance ranking on our Track Social Leaderboard because of a better performance across the board in individual metrics. Both brands deserve recognition for their success in harnessing social media to build and engage active online audiences. We’re sure this rivalry will see many more twists and turns. Facebook's IPO is a failure. Yes, it still trades for over thirty dollars, but it's drop in value was nothing short of disastrous. In such cases, most want an easy scapegoat. Though there are many that want to blame the company's awkward founder and CEO, he really does seem to be one of the few that can walk away mostly blameless. Instead, there is a cast of characters that share an equal amount of blame in the failure of the IPO. 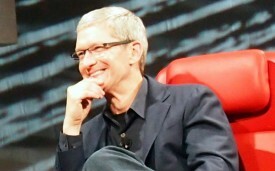 A good deal of the blame for Facebook's failed IPO needs to sit on the shoulders of the banks. At a typical IPO offering, most banks will tend to ask for more shares than they actually expect to receive. Many banks will only receive about half as many shares as they might ask for. In this case, banks got exactly what they requested, and the glut of shares was not helpful for any bank hoping to get trading done in an orderly manner. This helped the buying and selling of the shares to falter, and this likely helped lead to the poor opening-week showing of the stock. Part of the failure of Facebook's IPO has to fall on the shoulders of Morgan Stanley. The investing giant is rumored to have purchased far fewer shares of the stock than one would have initially assumed, thus both leaving too many shares on the market and failing to help drive up the price. There are rumors that the company had at least some advanced knowledge that the company's performance was not quite up to par, and any truth to that statement would put Morgan Stanley in a perfect position to want to see the stock falter. At the very least, the failure of the giant to buy shares did not help the initial performance. Facebook itself is also to blame for its own failure. The company's growth is not nearly up to par for its stock price, and the lower revenue stream necessarily diminished the value of the stock. Facebook might be a household name, but most of the money that passes through the social network - including paying to get more Facebook fans - never actually touches the company's coffers. Many have said that the initial stock offering was unreasonably high, and that it was at least overvalued by ten percent. In fact, many experts have even claimed that Facebook's real value should have been in the penny range. Unfortunately, the high offering was just too high to be sustained. There is, of course, also the matter of investors. Many investors jumped onto the stock in hopes of gaining access to a sense of prestige. Getting in on the ground floor of Facebook, at least to these investors, was like getting in on the ground floor of Apple or Microsoft. Unfortunately, too few of these investors remembered that for every Apple that there are ten Pets.com. The tech bubble should have encouraged a wait-and-see attitude from investors, but it simply seems that the big name attached to a high-valued initial offering caused some investors to set aside common sense. This will, unfortunately, only lead to things getting better before they get worse. As you might be able to tell, there is a great deal of blame to be passed around. Banks asked for too much stock, Morgan Stanley stayed away, and investors flocked to a company that is underperforming. This created a perfect storm for a failed IPO, and the results should not have been surprising. From this point, one should simply wait and see how low the stock will go before reaching a natural level. It has been fashionable lately to do some head scratching over Facebook’s acquisition of Instagram, which we now know came just weeks before the social network released a camera app of its own that looked a lot like, well, Instagram. But there's an argument to be made that Facebook owes no apologies to its shareholders. Maybe CEO Mark Zuckerberg’s move to buy Instagram was borderline brilliant. Writing for TheStreet.com, Rocco Pendola compares the acquisition to a strategy once favored by big radio station owners like Clear Channel and Citadel. In other words, Facebook is probably expecting that Instagram will cannibalize some users from its new phone app and vice versa. But it no longer matters: All of the revenue stays with Facebook, and it no longer has to figure out how to convert the 40 million people who already use and like Instagram. Meanwhile, any app maker thinking to enter the market may reconsider, as the market may be close to saturation. Indeed, while the tech press is still by-and-large embracing Facebook, the financial press has quickly tied Facebook to the whipping post. The release of Facebook Camera was seen as proof positive that Zuckerberg et al were capable of building a world-changing social network but not capable of running a publicly traded company. Facebook is not commenting on the acquisition, as the Instagram deal has not closed. The Wall Street Journal noted that with the ongoing slump in Facebook’s share prices, the deal is now worth less than $1 billion. Research tool, HighBeam Research, calculated the amount of media attention each company has received over the past several years. From 2004 when it was founded through 2008, Facebook remained well behind Google in the amount of media attention it received. 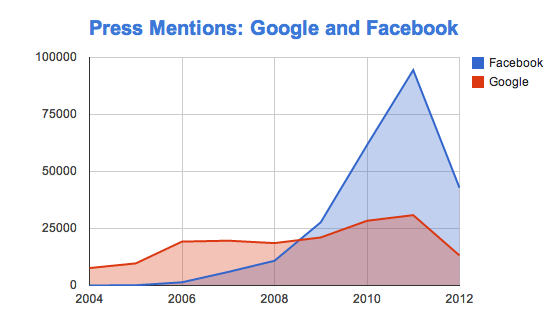 Then, in 2009, Facebook took the top spot with more than 27,000 mentions in the media. Since that time, Facebook’s media attention has only grown; and so far in 2012, it remains on top with more than 42,000 mentions compared to Google’s 13,000. Is Facebook that much more important than Google? Really interesting story being told here. Google is the larger company by far in revenue. And even in users (though Facebook is getting closer and closer). But Facebook, as a social network that people spend ungodly amounts of time on, captures the public’s attention. Scandals, natural disasters, politics, all kinds of news and media can revolve around Facebook elements. It is an online version of the real social world. Many think this public addiction and fervor for Facebook is the reason the stock sold at such a high price when Facebook held their IPO last week. Do we make social networks seem bigger and more important than they really are? It would also appear that those in the e-commerce world better also get “pinterested” if they have not already. Recently, Shopify, an e-commerce platform utilized by thousands of online businesses, analyzed data from 25,000 of their online “stores” and what they found was enough to make any e-marketer sit up and take a very vested interest in Pinterest. Their analysis showed that traffic coming from Pinterest is as much as that coming via Twitter. Pretty impressive given the “youth” of Pinterest compared to the more “aged” Twitter. Their analysis also showed that when a customer makes a purchase after coming over via Pinterest, they spend on average twice as much if they had come via Twitter or Facebook. Cue the obligatory infographic and also check out the stats Shopify threw in re: the fact that the daily number of Pinterest users has risen by 145 percent since January 1, 2012 and how Pinterest is now the third most popular social network in the world, having passed LinkedIn. Spoof Twitter Accounts: Marketing Headache or The New Satire? The Queen and Mark Zuckerberg have one. George Osborne (though only when drunk) has one. EvenAngelina Jolie’s right leg has one. Spoof celeb Twitter accounts are taking their place in satire, and becoming the new Spitting Image. And they’re not always unwelcome: Iain Duncan Smith was reportedly unfazed by his spoof alter-ego tweeting such insights as “Last night was messssyyyy!!!! Nothing beats G-A-Y on a Saturday night with Theresa May”. Sometimes, the laissez faire approach is the best one to take. Being too heavy handed with satirists can make you look humourless at best, and aggressive at worst. But there is a line between spoofing a celebrity (or brand) and impersonating them, however blurred. The spoof @QantasPR account wassuspended by Twitter after Qantas complained that it was ‘confusing customers’, which goes againstTwitter’s rule that: “You may not impersonate others through the Twitter service in a manner that does or is intended to mislead, confuse, or deceive others”. However, Twitter recognises the value of these parody accounts and their loyal followers, and has actually created guidelines for them, which emphasise that the spoof account should be named as such (e.g .‘@NotCelebrity’) and that the bio should clearly state that the account is a parody. Less funny, perhaps (from the brand’s perspective at least), is BP’s spoof account, @bpglobalpr. Tweets such as: “ATTN Smokers: Do you love messing with carcinogens, but you hate the taste? Eat gulf shrimp! #FDA #bpcares” and (this in response to a concerned consumer) “We're sorry you're upset. Please send us your address to receive a free* "bp cares" t-shirt? *$25 shipping” can’t help an already troubled reputation. Where spoof accounts really have the potential to do reputational damage is when they are mistakenly picked up by media. There were red faces across CNN and Huffington Post recently when both titles reported stories based on tweets from an account that claimed to be from North Carolina Governor Bev Perdue. In the UK, the Media blog reports a Daily Mail story that Katie Price had used her Twitter account to take a swipe at new mum Stacey Solomon (the tweet actually came from a spoof account @MissKatiePriice. The real Ms Price then took her own swipe at the Daily Mail for not checking sources properly). Faking tweets isn’t completely alien to Ms Price, who found herself at the centre of an advertising-based Twitter storm, when Mars used her to send ‘out of character’ tweets on the Eurozone debt. The tweets ended with a picture of her eating a Snickers bar, with the line: “You’re not you when you’re hungry @snickersUk #hungry #spon”. While the campaign was cleared by the ASA, ads were criticised for not marking clearly that they were sponsored. 1. Make it harder to spoof in the first place. Own your brand name on Twitter, and all reasonable variations of it, and manage the account so it’s visible. 2. Decide whether your reputation will suffer more damage by the spoof account, or by shutting it down (remember Nestle’s attempt to remove Greenpeace content from YouTube?). Abusive, offensive or spammy tweets from an account that purports to be from your brand is going to do you harm, and should be shut down. If it’s funny, or harmless, you could look overly confrontational by reporting it. Consider asking the account holder to make clear that the account is a spoof, to avoid genuine confusion. 3. If you feel you are being impersonated (as opposed to gently ridiculed) report it to Twitter by filing a report ticket. Twitter lists: brandmark and trademark complains; breach of privacy; copyright complaints; impersonation; name squatting among its terms violations (and of course all illegal, pornographic or spam content). Twitter do have a verification system in place to confirm whether an account holder is who they claim to be. Any account with a blue verified badge on their Twitter profile is a verified account. Whether or not is effective, free to use - or indeed in operation - is a moot point, as the recent case of the (verified) @Wendy_Deng account demonstrated in January this year. In fact, tweets such as (to Ricky Gervais): "i think you look HOT ricky!!! (sssh dont tell @rupertmurdoch!)" weren’t coming from Murdoch’s wife at all but a bored British man living in London. Of all brands who got punk'd, to use Jeremiah Owyang's typology, Domino's is certainly up there, due to the infamous video showing the inappropriate behavior of a couple of employees. This example has been rehashed many times, but rarely under the microscope of network scientists. In this video entitled "managing bad news in social media: how social media users react to corporate bad news", researchers analyzed Tweet patterns around the initial prank video, and the video response by Domino's CEO. The good news: The response video was somewhat effective insofar as the volume of tweets and overall negative sentiments dropped right after Domino's CEO posted his video statement of apology. The bad news: Unfortunately, and unsurprisingly, the prank video was a lot more popular than the response video. So, if the response video was barely picked up by those web users who had propagated the prank video in the first place, how come the crisis slowed down on social media after the apology video? The response, elegantly visualized by the researchers, lies in a network within the network (colored in blue on the video) composed of the twitterati: social media experts, journalists and power bloggers with denser networks. These users, typically logging many more followers than the average user (yes, that big white dot going supernova is Scobleizer) play the role of superconductors to use a fitting electricity analogy. As such, they can accelerate the spread and visibility of a message, turning an obscure tweetstorm-in-a-teacup into the trending topic of the day. In fact, they may very well have done just that in the initial phase of the Domino's crisis, although this is not apparent from the research summarized in this animation. More interestingly for communicators who often lament the fact that bad news spreads like wildfire but rebuttals hardly get any traction, this research emphasizes the importance of reaching out to these influencers, as early as possible. For good or bad reasons (let's admit it: there is a rubberneck syndrome of watching the next twitter trainwreck as it happens), these experts and commentators pay more attention to the twists and turns of the social media crisis when the average web user has already moved on. In addition to being more attentive to a brand's response, there is also a certain lag effect online crisis managers know well: Twitter works in real-time, but blog posts may take a few hours, maybe even a day or two to be written. That time difference is a window of opportunity to respond and attempt to get the company's statement out fast enough to be picked up in the inevitable blog posts covering this latest social media crisis. These posts by influential commentators will in turn create a second wave of tweets and retweets. This second cycle of social media coverage can make the difference between successful online crisis management and becoming another Twitter roadkill. You've probably already heard about Google+ Hangouts, which allow you to video chat with up to 9 different people at once. Hangouts On Air allow you to publicly broadcast your Hangouts on YouTube and your Google+ stream for anyone to watch. In another recent Google+ update, Google+ added a Hangout icon in the left navigation ribbon to promote all the public Hangouts. While in your Hangout, you can grab the YouTube video embed code and paste it into your blog or website to get more viewers and reach. After your Hangout On Air, you can edit the video in your YouTube account (connected to your Google+ account). Simply log into your Google+ account and click on the Hangout button on the right side of your stream. After naming your Hangout and clicking on the Enable Hangouts On Air box, you'll get a pop-up informing you that the hangout session will be streamed on your YouTube channel and on your Google+ stream. The first step in starting a Hangout On Air is to click on the Enable Hangouts On Air box. Anyone else you invite to join your Hangout will also receive a note to inform them the Hangout will be live-streamed on YouTube. After you've finished your Hangout, it could take up to an hour before the video appears in your YouTube account. 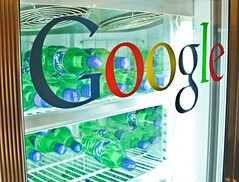 There isn't a way to associate your Google+ page Hangout with your company YouTube page at this time. All Google+ Hangouts On Air are automatically associated with the page administrator's YouTube account. While hosting your Hangout, you can go to your Google+ profile to watch the video streaming. It's important to choose a unique name for your Hangout because others might unintentionally join simply because they typed your Hangout name when creating their own. Social networks and blogs continue to dominate Americans' time online (accounting for nearly a quarter of total time spent on the Internet) according to a recent Nielsen report on social media. Google Analytics is a fantastic way to measure how much traffic is being referred to your website from the various social channels. For each piece of content you create, monitor unique page views, time on page and total pages viewed. If unique page views go up, that's an indication that your reach is growing, increased time on page shows that your content is interesting to the visitor and increased total page views means your visitor wants to learn more by clicking on other pages around your site. This will give you a snapshot of your top pieces of content along with detailed metrics including page views, unique page views and time on page. With social media, share of voice refers to the number of conversations about your company versus your competitors/market. The formula for calculating SOV is simple: divide the number of conversations or mentions of your brand by total number of conversations or mentions about other brands in your market. Using a social CRM tool is a great way to integrate customer data with social profiles and interactions while monitoring growth and engagement levels. The social metrics used to determine success are the ones that make sense for your business and that you can tie back to your marketing bottom line.